Secrecy shrouds The Witcher Netflix series. We don't know who will dye their hair to become Geralt, what stories the show is going to tell and when it will start streaming. The list of the unknowns doesn't end there, either. However, what we do know about it is a cause for optimism. The initial announcement back in May named five people involved in the project. And each of the confirmed names spells good news for the series. The Hollywood duo of Sean Daniel and Jason Brown will produce the show together with a Polish team of The Witcher lore experts: Tomasz Baginski (who will also direct at least one episode per season) and Jarek Sawko. Andrzej Sapkowski, the grumpy creator of The Witcher saga is also along for the ride to consult with the showrunners on creative matters. While Sapkowski is a household name by now, you may not recognize Baginski and Sawko. But you're almost certainly familiar with their work. The same goes for Daniel and Brown. Let's have a look at what each of them brings to the conference table at the Netflix offices. "Sawko is also making a name for himself with gigs like the visual effects producer on this year's Wonder Woman"
Baginski and Sawko both hail from Platige Image, a Polish creative agency working on the crossroads of technology, culture, and commercial cinematography. While Baginski is the better known of the two, it's Sawko who produced most of his greatest hits. Baginski joined Platige Image in 1997 on the strength of his debut short film Rain. After almost five years of tinkering came a breakthrough. Platige Image's next big project, The Cathedral was directed by Baginski and produced by Sawko and went on to garner almost universal critical acclaim. The short film was nominated for an Oscar in 2003 and won the Best of Show award at the prestigious SIGGRAPH festival for digital film and video. And that was just the beginning of a long and successful working relationship. Their next cooperation titled The Fallen Art won a BAFTA and another SIGGRAPH award in 2005, which was the first instance of the same filmmaker winning it twice. Baginski's next effort called The Kinematograph, a rare instance of him working without Sawko, had to settle for a Golden Lion nomination at the Venice Film Festival in 2009. Through the memorable assassination on a boat. Culminating in this masterful pace-setter for The Wild Hunt. For most gamers, the first contact with Geralt came through these glimpses into his world. Each of them needed only a few minutes to establish the rules, the look and the tone of the adventure awaiting them. At their best, The Witcher games are living up to the promise of their intro videos. So it’s little wonder that when it was time to announce the next big game, CD Projekt Red employed Baginski and Sawko once again. The resulting teaser trailer is a two-minute master class in world-building. Not to mention that four years later, it’s still the only concrete proof of Cyberpunk 2077's existence. Baginski often draws inspiration from Polish culture and history that so heavily informed The Witcher saga. Here’s his take on The Animated History of Poland in a short film shot to promote tourism in Poland. According to the show announcement, the creators aim to adapt the Witcher books and not the games. Yet CD Projekt Red's take on the world of The Continent is so impactful and faithful to Sapkowski's prose that escaping the game trilogy's shadow, particularly its visuals, will be almost impossible. Baginski helped establish CD Projekt Red's vision with his work on the cinematics for the games. He's the right man for the job of molding all the previous takes on The Witcher (yes, even the awful Polish movie/TV show from the early 2000s) into the ultimate experience for the saga's biggest audience yet. At the very least, the show is likely to sound like the games. Mikolaj Stroinski, CDPR's composer of choice, was spotted at the Netflix HQ in Los Angeles in June, sparking rumors of his involvement. Stroinski resides in L.A., so we can't rule out he stopped by Netflix to say hi or to discuss scoring other projects, but the timing doesn’t leave much room for doubt. And then there are Sean Daniel and Jason Brown. While the two producers had nothing to do with The Witcher prior, what they bring to the table is the experience. In the entertainment business, that's as (if not more) important than knowledge of the lore. Daniel is a Hollywood veteran with a resume including roles as the production president at Universal and the head of his own Alphaville Films. He has supervised such iconic flicks as The Blues Brothers, Back to the Future and the original Mummy trilogy (this year's flop reboot gave us a new appreciation for the Brendan Fraser vehicle, right? ), to name a few. Brown is a relative newcomer, but he has already proven himself as an efficient team player. The Expanse - which he executive co-produces with Daniel - is one of the best sci-fi shows in recent memory and a faithful adaptation of its literary source material. Perhaps this time around Andrzej Sapkowski will, at last, be satisfied with someone else's treatment of his life's work. Speaking of Sapkowski, he's the last piece of the puzzle. 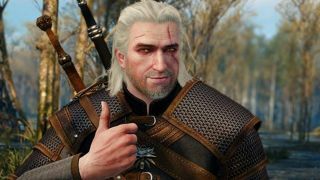 Sapkowski's involvement isn't necessary for a successful, fan-approved adaptation of The Witcher saga. His input on the games has been minimal, having only been involved in a minor capacity for the original. Still, having the Polish author around to consult on the script can potentially help the show be as witty and rooted in the gray areas of life as the books. Or, at the very least, spare us endless news items covering Sapkowski's disenchantment with the creators.